With power connected, it was time to start work in earnest. 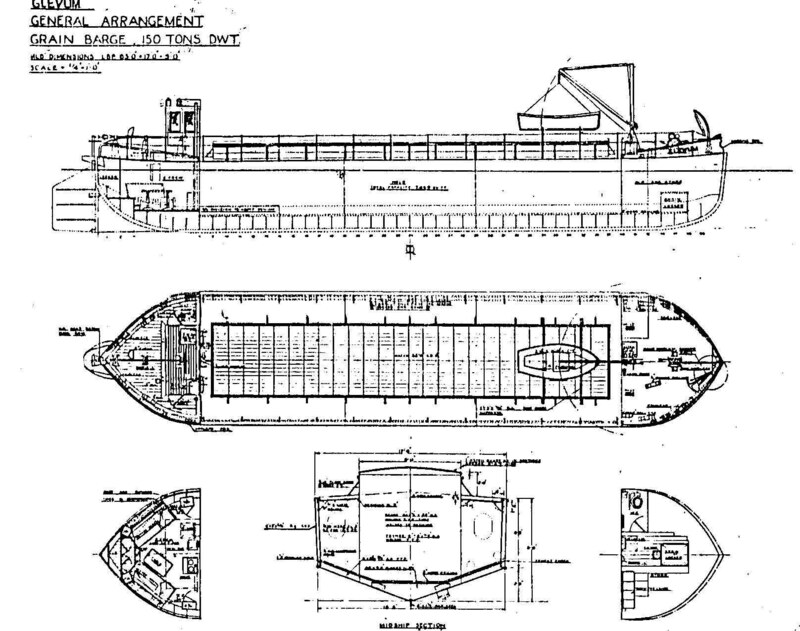 I had now drawn up detailed plans for the reconstruction of the wheelhouse and this was to be much larger than the original, to allow for a covered stairway down to the gallery, but I did not want it to look out of place. In the hold, we rigged a couple of six-foot fluorescent lights from the hatches. By one of those quirks of nautical terminology, the wooden floor of the hold was called the ceiling. This was made from planks of Douglas pine, two inches thick, twelve inches wide and twelve to sixteen feet long, each bolted to the ribs of the barge. These allowed the grain to be lifted out from a smooth surface by the mechanical extractor at the flour-mills in Gloucester Docks. Sanded and polished, it would have made a lovely floor, but several planks were badly damaged and the cost of replacing them, quickly put paid to that idea. It would be far too expensive. Still, all that lovely timber was a resource not to be overlooked. As the planks were still very wet, we unbolted most of them, stacked them as if for seasoning and hired a dehumidifier, which we set running in the hold. I was amazed at how efficient this turned out to be. Twice a day, I had to empty a two-gallon bucket that the machine had filled! While we were waiting for the stacked timber to dry, I drew up a detailed cutting list and we bought a small, portable Elu circular saw. This seemed tiny for the job in hand, but I knew from previous experience that these were some of the best saws on the market and not too expensive. The only problem was, that the lengths of timber we had to cut would be far too heavy for the lightweight saw bench. To cope with this, I made two wooden trestles, each with a steel roller on top. With one of these positioned at each end of the saw to take the weight of the plank, we hoped the problem would be solved. After about four days, the dehumidifier had done the job and very little water was now being extracted; it was time to start cutting. We had left some of the planks down to provide a stable working surface, we set the saw and the rollers up on these and found, to our relief, that the system worked. However, our first day cutting was awful. It was, by now, December, gales had blown up and we were freezing cold. The inside of the hold was dark and gloomy and, in the wind, the boat was rocking quite a bit. This made it difficult to keep an even feed on the planks as they went through the saw, but far worse, the lights were swinging back and forth, causing the shadows to swing crazily about and making it very difficult to balance. By the end of the day we both felt very ill.
Next morning, my first job was to fasten the lights tight against the hatches. This stopped them swinging around and made things much easier. We found that the rocking was not too much of a problem, now that all the shadows were keeping still. At the end of the day we had quite a nice stack of 4″ X 2″ timbers to show for our efforts. After this we cut 3″ X 2″ and then 2″ X 2″. Finally, Kate cut down even the smallest battens. In a couple of days all the wood we needed for the wheelhouse was cut. The planks that I had left down as a working platform, we would eventually use to make the stringers and treads for the stairs. Now we were faced with the hardest decision yet, not least because it meant spending some real money. Who could we get to do the steel cutting and welding? At last, in November 1983, we had the Glevum in Bristol and all our plans could now be put into practice. In truth, most of them had still to be made. It may seem a bit strange that we had made such a commitment without a detailed plan of the work involved but, until I had the Glevum in Bristol, it was difficult to imagine all the processes that would be involved. Above all, everything we did had to be the most economical option available, we had started with a budget of less than £10,000 and the purchase of the Glevum had already cost more than a quarter of that. We had the small plan shown below, but as far as we could ascertain, this was the only paperwork on the Glevum that was still in existence. 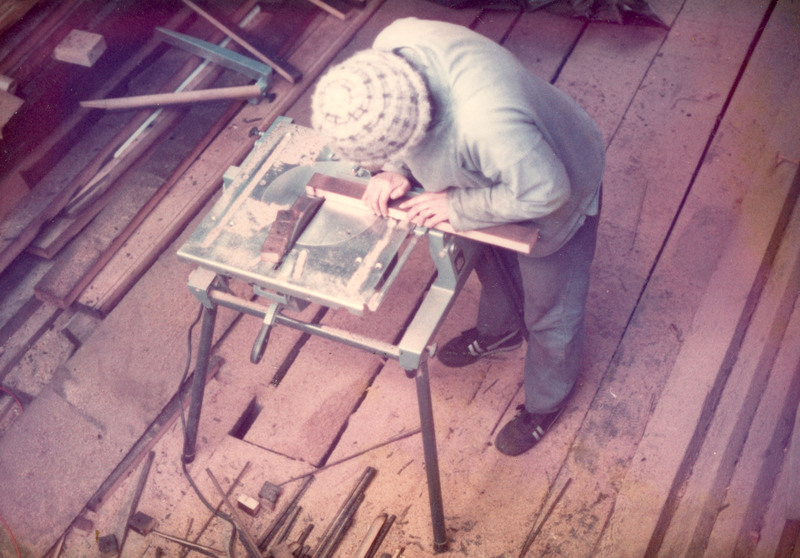 My trade of carpenter and joiner were to stand me in good stead, but I had no experience of working with steel. Under the rust, Glevum was sound as a bell. A tribute, not only to the shipyard that built her, but also to the time in which she was built. Her steel plating was massive in comparison with that on some barges built a decade later. 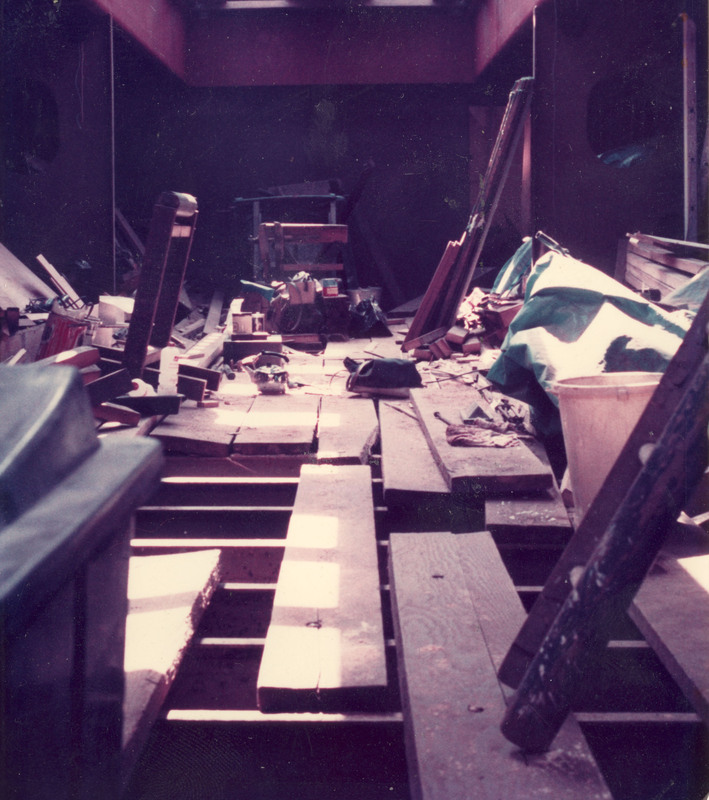 Whilst looking for a suitable vessel, I had inspected many, and, by the early eighties, most of the newer barges were in pretty poor condition. In the mid 1950s, they were still building them to last. The day after we arrived, we decided that the first job was to pump out the hold. In the years she had lain idle in Gloucester Docks, the tarpaulins covering the hatches had become leaky, with the result that there was about two feet of water slopping about in the bilges either side of the keel. During the journey to Bristol, I had been exploring the cabin in the after peak. It was accessed by lifting a watertight hatch in the corner of the wheelhouse and climbing down down a vertical companionway. 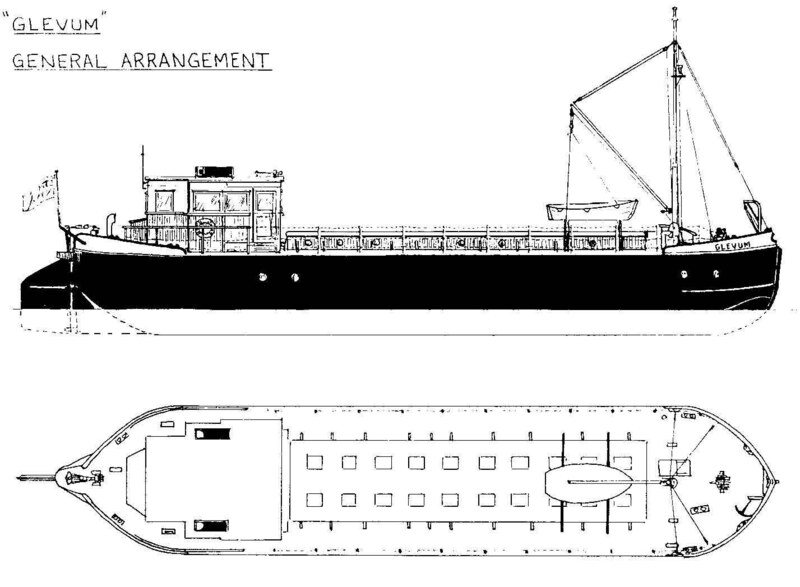 Although gloomy and neglected, the layout was almost identical to that of an old ketch or schooner. Seating ran down both sides with folding bunks above. In the middle of the cabin was a free-standing table with lift up sides for use in rough weather. It was made from such huge baulks of wood, it looked as though it could have taken the weight of the barge. An old cast-iron stove, with a small oven and hot plates on top, stood against the bulkhead that divided the cabin from the hold. Against the bulkhead in each corner was a locker and it was in one of these that I found the original hand pump -and the leather valve on the pump had appeared to be in workable condition! Kate and I decided to test the old pump to see if it could still draw up water. We located the pivot rod into the recess beside the pump pipe, primed it with a gallon or so of water from the dock, and started pumping. For such a primitive system it was remarkably effective, each stroke of the pump drew up at least a half a gallon of water. At this rate, I thought, we should have her dry in an hour or so. We took turn and turn about on the pump. After about two hours, the water was still gushing over the deck and down into the dock. We were loath to stop, as priming the pump again meant pouring more water in! So we doggedly pumped on, and on, and on. Having started pumping at about half past ten in the morning, by four o’clock in the afternoon I was getting seriously worried. Were we leaking? I was sure that the barge was sound, but the hold was only sixty feet long and surely we should be dry by now! Just as I was about to give up, two things happened. The first was that the ferry went past, and as we started to rock in its wake, the pump faltered and made a sucking, gurgling sound which vaguely resembled someone sucking the last drops from a bottle through a straw: it was music to my ears. The second was the arrival of the tender from the restored ketch Irene. A crew member hailed us and asked if we would like to borrow their motorised pump! After a couple of days at our temporary mooring in St Augustine’s Reach, we moved the Glevum to her permanent mooring on Prince’s Wharf. Here, we had access to the quayside electricity points and I was anxious for some real work to begin. First, however, I decided to take on one more job that required no power. I wanted the Glevum to be accepted in the docks and, in her neglected state, she looked a sad sight. So I hired a pontoon and made a start on scraping and wire brushing the rust and painting the hull with pitch. We had entered into a very cold and frosty spell of weather and, working at water-level, it was a grim task. Scraping and wire brushing the rust was bad enough, I had soon taken the skin from every knuckle, but worse still, was trying to apply pitch to freezing cold steel. Although it was reasonably liquid in the drum, as soon as the laden brush touched the freezing metal, the pitch would stiffen to something like the consistency of putty. During the repetitive work, I pondered how the finished conversion should look. In the evenings, after a a shower and a hot meal, I would sit at my drawing board and put the day’s thoughts down on paper. 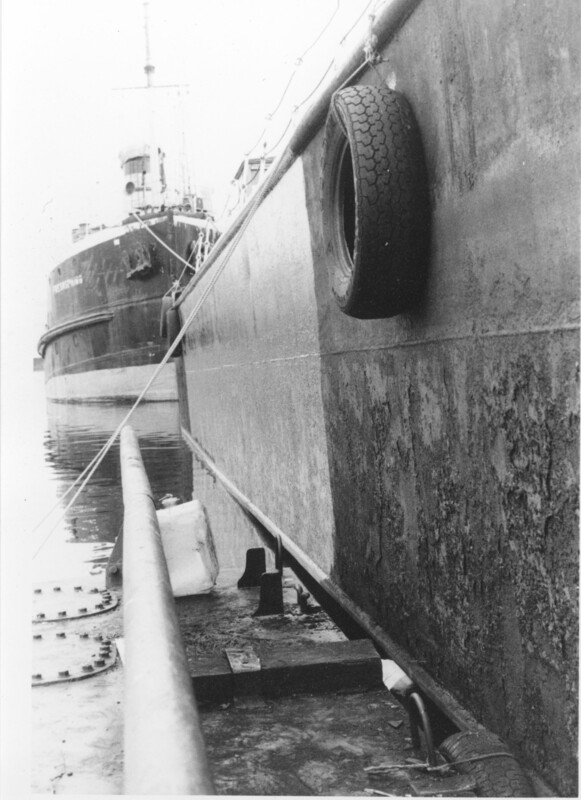 In all, scraping and painting the hull took over a week and used ten, five-gallon drums of pitch, but I now knew every plate of the Glevum’s hull – intimately. (Incidentally, the next time I tackled this job, it was in the middle of summer and, in the warm weather, I only needed one and a half drums to cover the same area). As soon as the hull was finished, I scraped and wire brushed the forward bulwarks and painted them white, then painted the name in black letters. When this was finished, she looked like a different vessel, so it had been a worthwhile exercise.